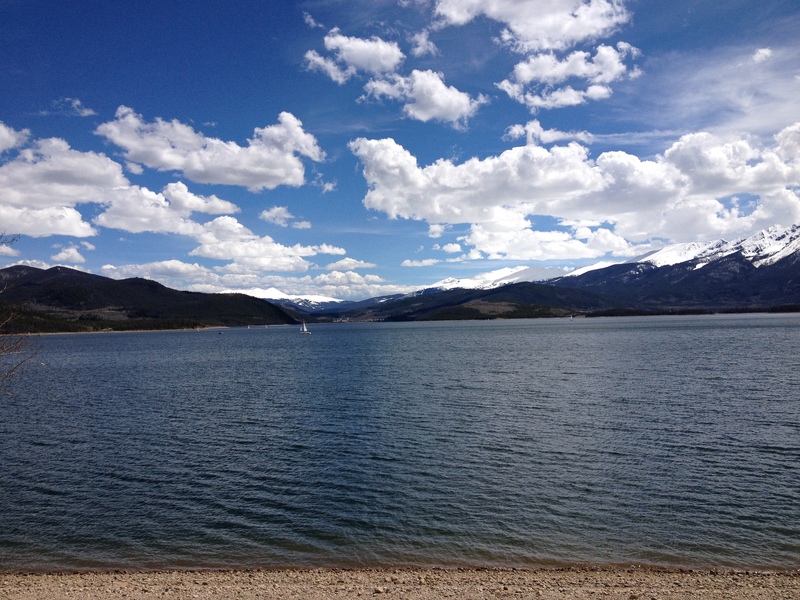 The Appropriately named Summit County (Colorado) sits right in the heart of the Central Rocky Mountains. With multiple mountain ranges extending into the County on all sides, anywhere you will travel within the County, you will be pretty much surrounded by mountains in all directions. In fact, Summit County is one of only six counties in the entire nation with a mean elevation of over 10,000 feet. 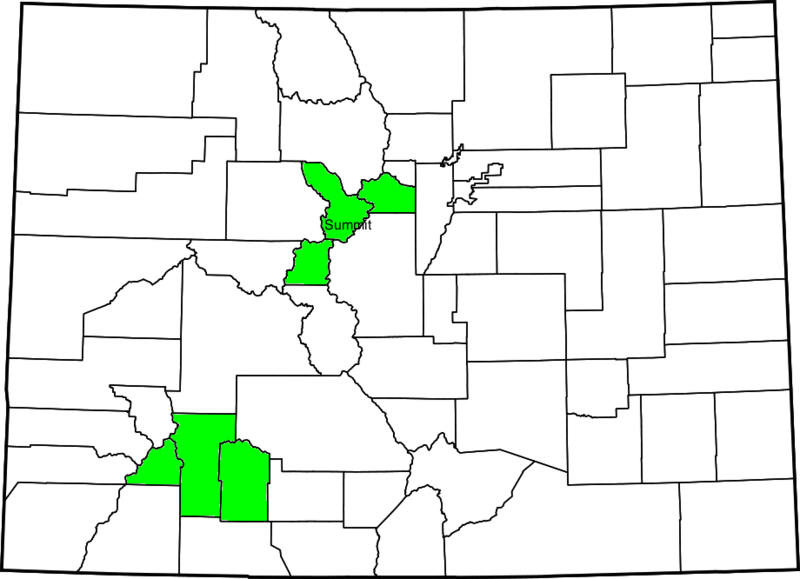 All six of these Counties are within the State of Colorado. Outside of Colorado, not only are there no counties with mean elevations greater than 9,000 feet (Colorado has a total of 15), but only three counties outside of Colorado have mean elevations exceeding 8,000 feet (Colorado has 24). Those looking to “go to the Mountains”, would be hard pressed to find a more suitable place than this one. Summit County is probably best known as a skiing destination, with five popular ski resorts, including the incredibly popular Breckenridge and Copper Mountain. However, it may also be one of the best places in the world for high-altitude cycling, which is important for those who train at high altitude to increase lung capacity. Due in part to a series of rail lines that were created during gold and silver rushes and later abandoned in subsequent bust years, the county has an extensive network of recreational pathways. The re-purposing of abandoned railways as recreational trails is actually the source of some of the nation’s best bicycling trails. For those interested in seeing these rails-to-trails well maintained, and seeing more created, there is an advocacy group called the rails-to-trails conservancy leading this effort. These recreational paths connect almost all destinations within the county. Within this network of trails, one can find relatively flat rides, as well as intense climbing, all with a variety of amazing scenery. The network is largely centered around the town of Frisco, a town of roughly 2700 people at an elevation just under 9,100 feet. 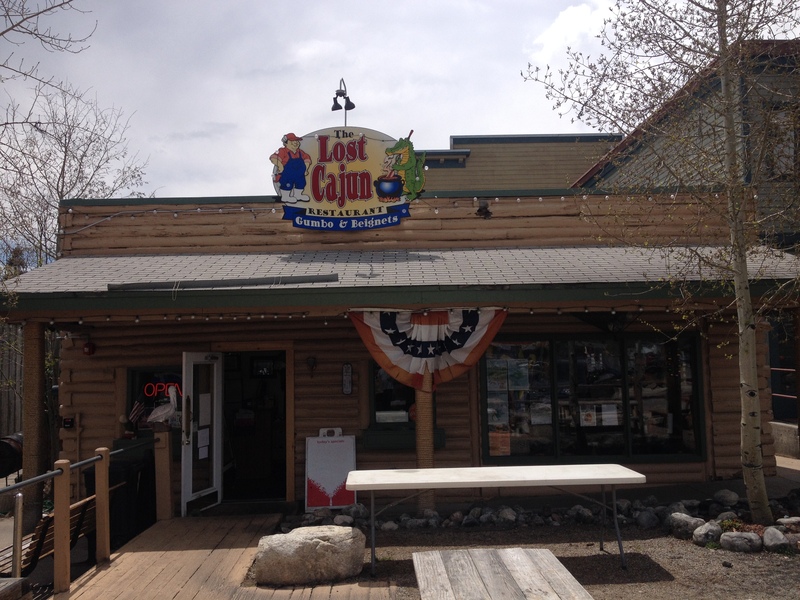 Located just off of Interstate 70, it is a relatively easy place to get to (when there aren’t traffic delays), and as good of a place as any to use as a home base for a weekend of high altitude cycling. 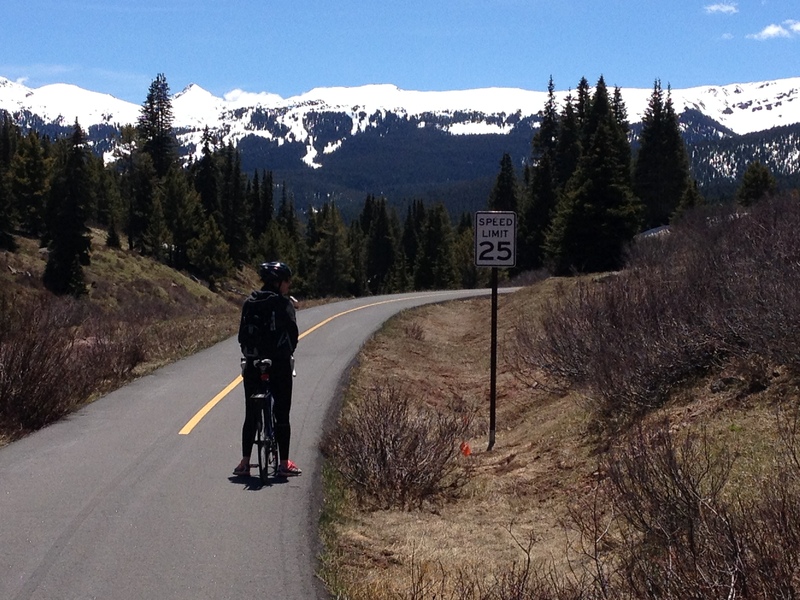 My first ride of the weekend was also the toughest one, from Frisco west to Vail Pass. 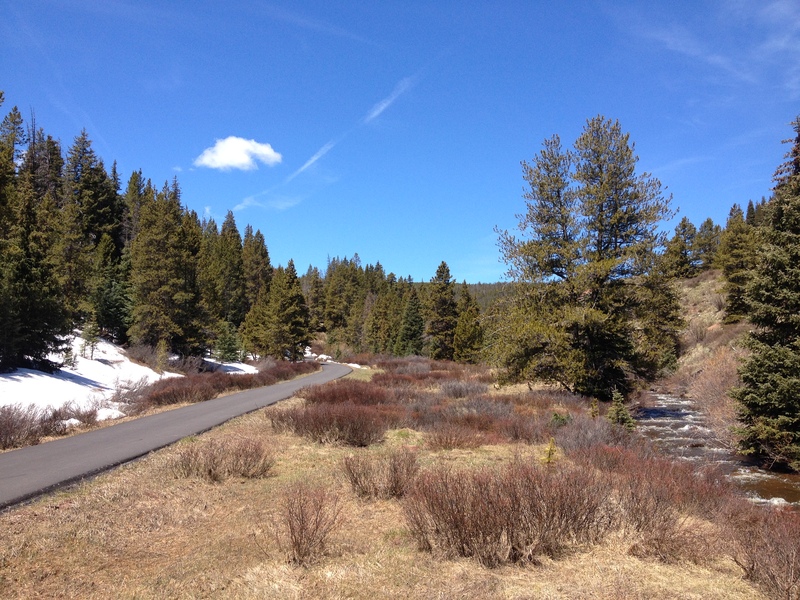 This ride involves two trails, the Tenmile Canyon trail and the Vail Pass trail. 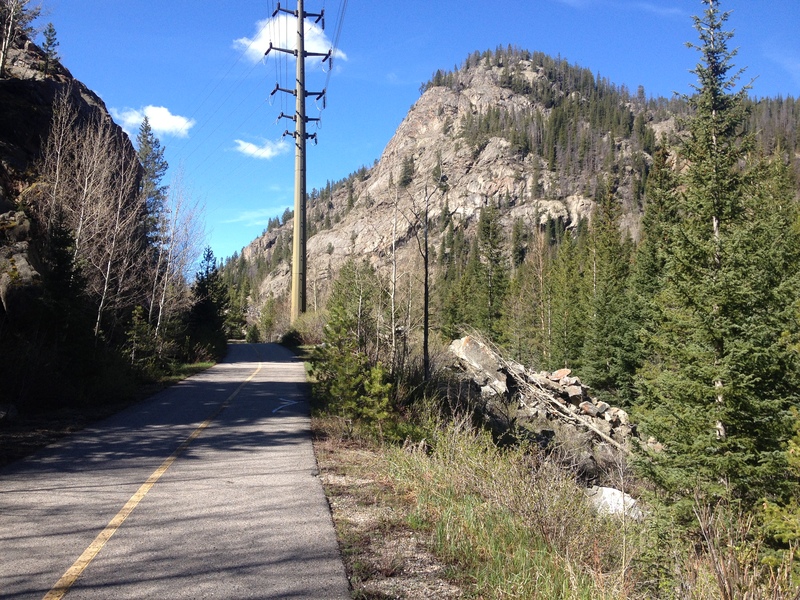 Heading Southwest from Frisco, the first few miles on the Tenmile Canyon trail includes a fairly significant amount of climbing. Indicative of how recreation-centric this part of the country is, the entire trail network is well marked, with signage indicating which trails lead to which towns, and a significant number of signs like this one, indicating mileage. 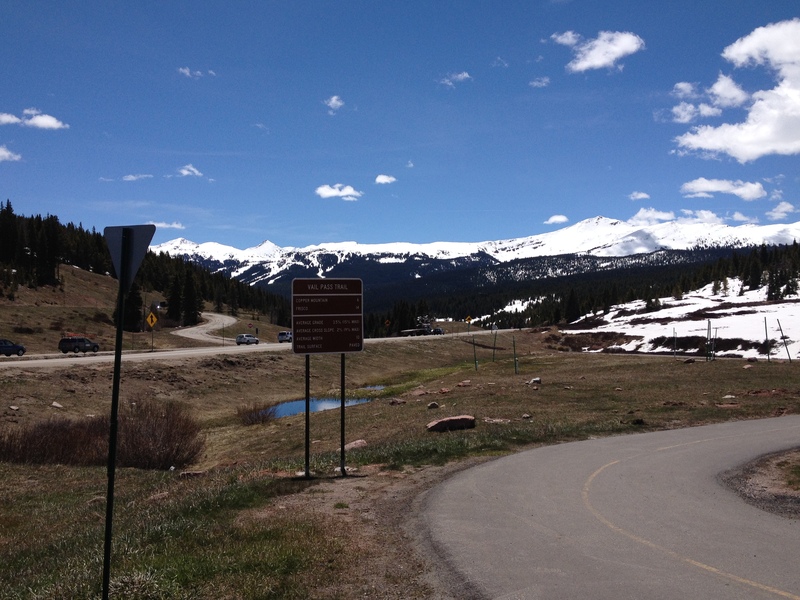 This sign denotes the halfway point between Frisco and Copper Mountain. And while the total mileage to Copper is 7.4, a cyclist that has reached this point has already done most of the climbing from Frisco’s 9,100′ elevation to Copper’s 9,800′. In fact, the final couple of miles of this trail, headed into Copper is pretty much flat. But, even during this flat segment, I knew where I would be headed, which would bring me farther up into the mountains. With it not being ski season, and there not being an actual town there, there was not much going on in Copper Village. Many places were closed. 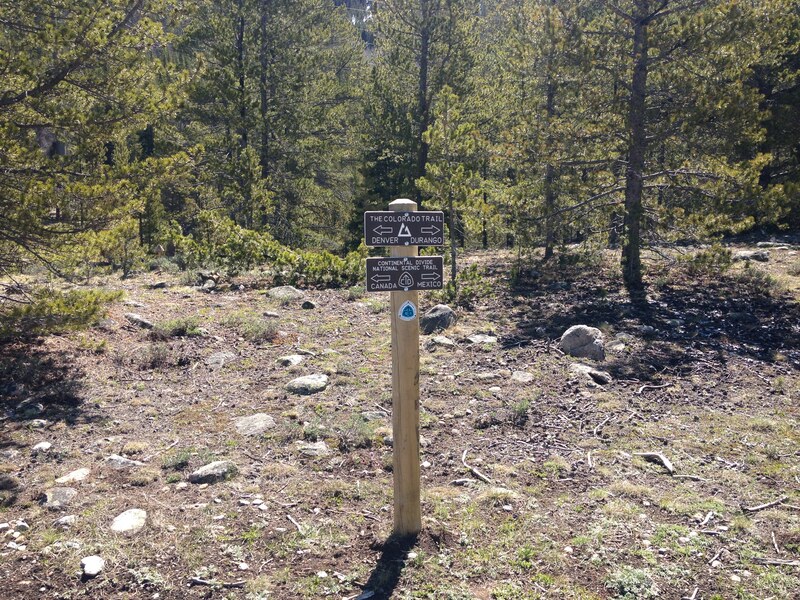 The most notable thing I encountered while at Copper was a junction with both the Colorado Trail and the Continental Divide National Scenic Trail, which share the same path here. Just the thought that anyone I encounter cycling or hiking could be headed as far as Durango, or the Mexican border, is just incredible! At the West end of Copper Village is the Vail Pass trailhead. 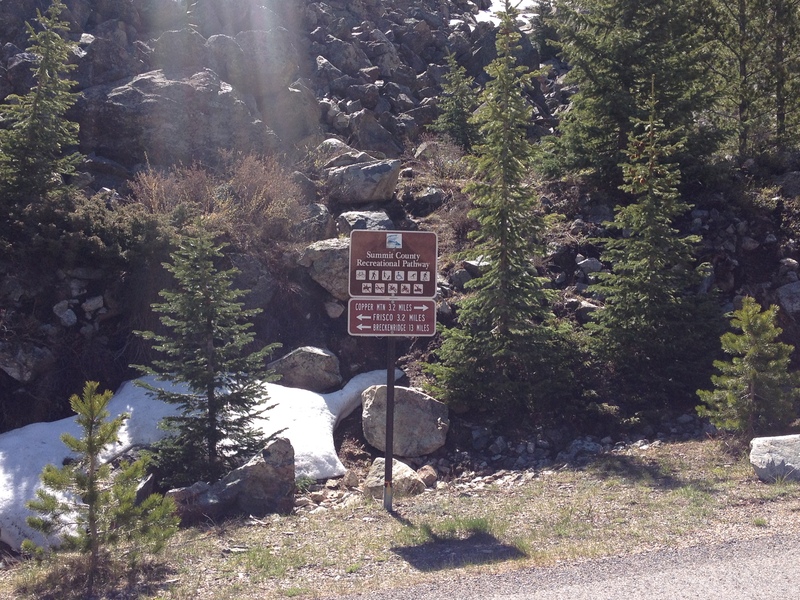 Despite what is indicated in the signage, the trek from Copper to Vail Pass is actually only four miles. Not only did I clock this myself, but a cyclist with over twenty years of experience cycling here told me that this sign has been “wrong for over 20 years”. 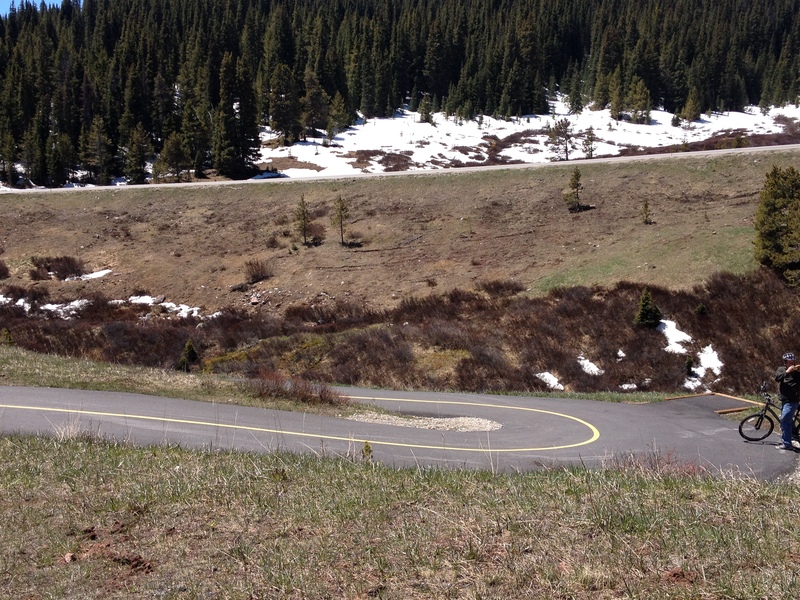 The Vail Pass trail is kind of a mixed bag. Over four miles, the trail climbs somewhere between 800 and 900 feet. However, it is a mix of some fairly flat segments, and some fairly intense areas with switchbacks and such. I would say there are three sections of this trail that are intense climbing. One fairly shortly after beginning the climb from copper, one right in the middle, or about two miles from Copper (pictured here), and one close to the top. 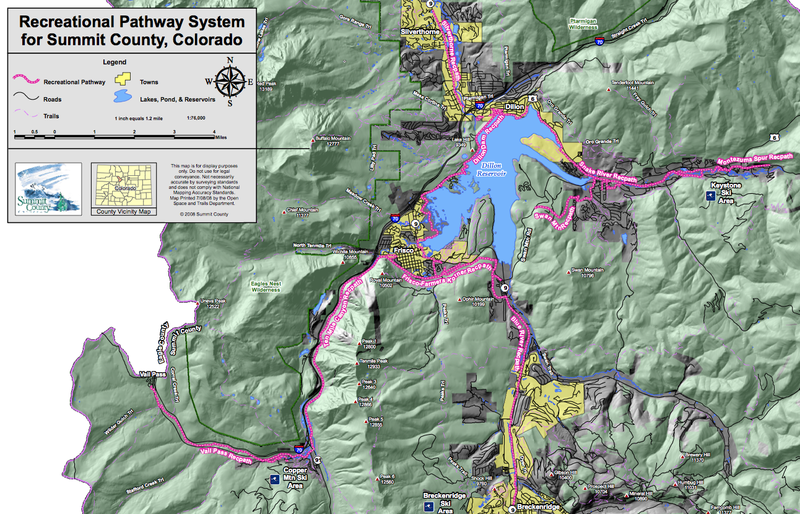 Strangely, most of this trail is actually in the middle of I-70, between the Eastbound and Westbound lanes, which are farther apart for much of the segment between Copper Mountain (exit 195) and the Vail Pass summit (exit 190). The top of the trail is a rest area that cyclists share with motorists. Here, a connection could be made with the Eagle County tail network, and cyclists could continue West towards Vail Villiage. However, my plans take my back towards Frisco, where, I not only encountered another sign indicating that the trail is six miles long rather than four, but a speed limit sign. I am not sure if and how this speed limit of 25 is enforced. But, it does provide those concerned with safety with a guideline. The descent back to Frisco, just over 12 miles in total when one includes getting from the tailhead back to home base (in my case Hotel Frisco on Main St.) went rather rapidly, at a speed that must have averaged fairly close to that assigned speed limit. After stopping for lunch, in the afternoon, I took on another ride to explore more of the Summit County trail system. 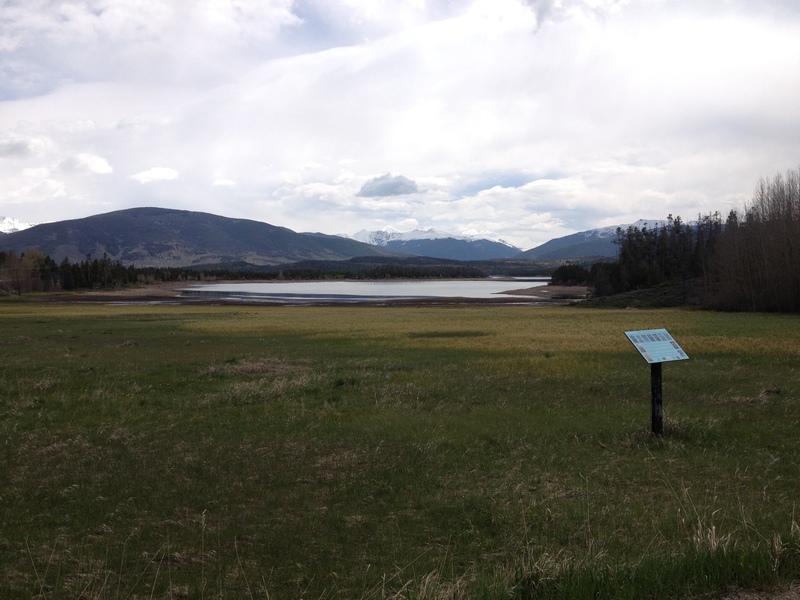 This one, a loop around the Dillon Reservoir. The ride starts out “flat”, as the trail stays at roughly the elevation of the lake. However, “flat” here is a relative term. 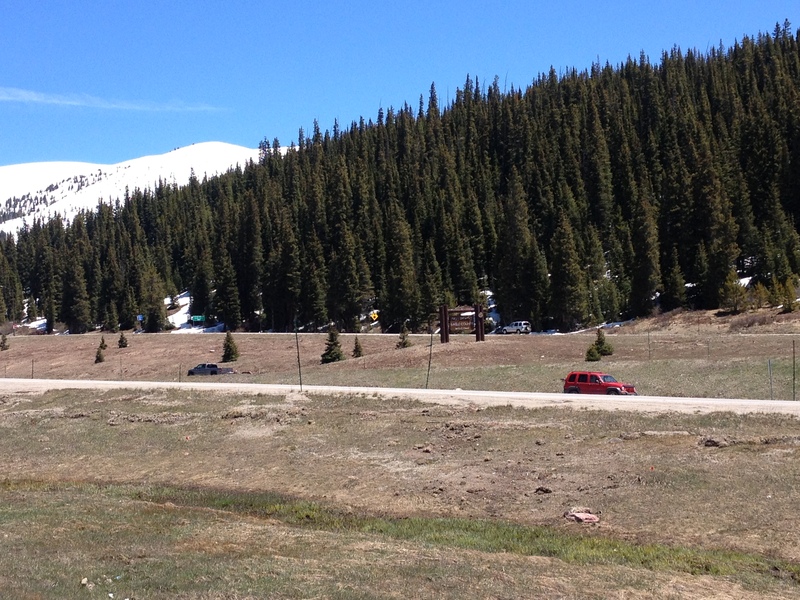 Even the rides described as flat and easier, here in Summit County, can contain some rolling hills. And, while significantly easier than a “climb”, these trails are nowhere near as flat as a trail one would find in a place like Illinois where there is pretty much no terrain change. There are small rolling hills, as nowhere in Summit County is really flat. 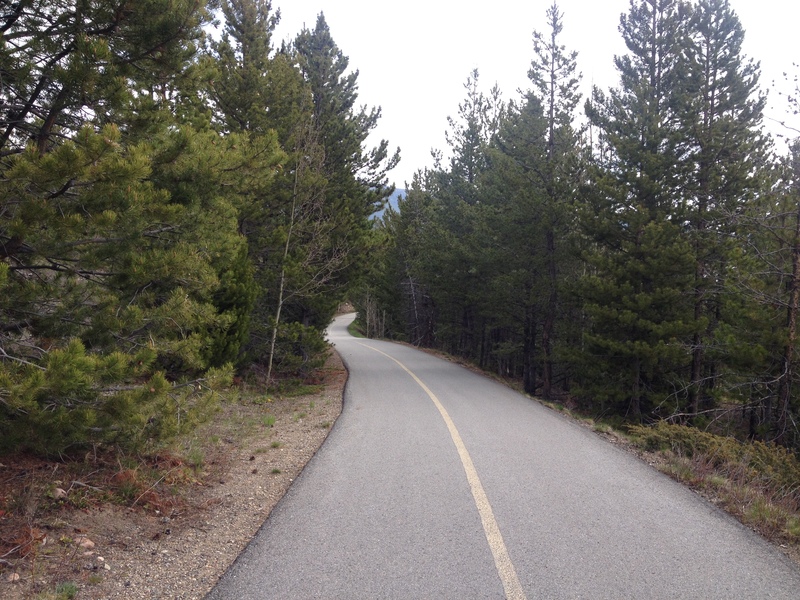 After a fairly “flat” ride on the Dillon Dam recpath and the Snake River recpath, in order to traverse the entire loop around the reservoir, one must climb Swan Mountain, which is actually a 1200′ climb. After two significant climbs, and nearly 50 miles of exploring this amazing system of trails, I was ready to call it a day. I did a little more exploring on Sunday, mostly on the easier trails. I came to really appreciate the portions of these trails that wind through the trees, often with small rolling hills. While getting up to the top of a major climb provided me with a sense of accomplishment, these trail segments were just pleasant and enjoyable to ride through. The smell of the pine trees reminded me of cabins, and camping, and all the things we do in life to get away from our day to day responsibilities. The twists and turns just made me feel like I was on a ride of sorts, almost like a roller coaster in some places. And, there were some other interesting areas, like these bogs. In the end, I am glad I did both the big challenging climbs, and the gentler trail sections. And, I was also glad to have experienced the town of Frisco a little bit more. Frisco is somewhat of an interesting place. 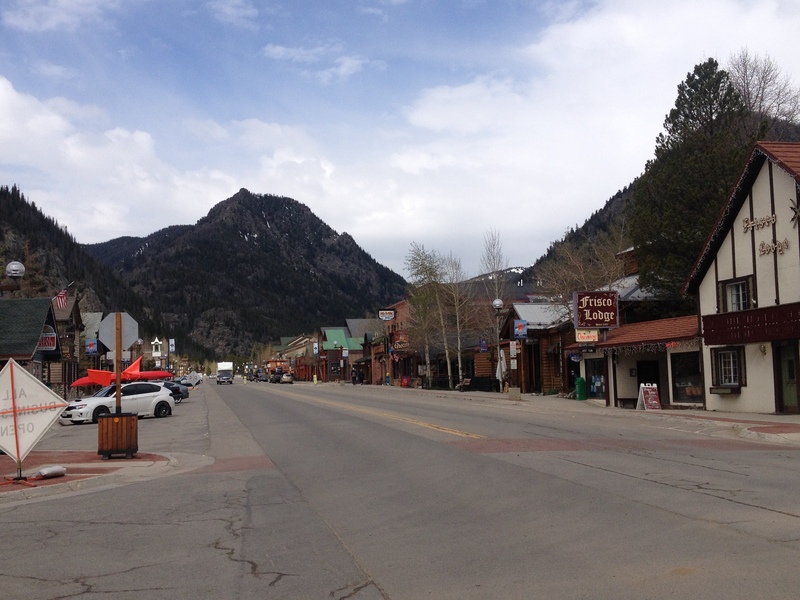 It has that Western feel that many of these towns have, with a Main Street lined with stores, and mountains in the backdrop. It is somewhat touristy, but not overwhelmingly so. It seems to occupy some kind of middle ground. With bus service to Breckenridge, Copper Mountain, and Keystone ski resorts, they get their fair share of ski related tourism. But, not as much as there is in Breckenridge, or any other town that is actually adjacent to the ski resort. This appears to have created demand for a variety of different hotels and restaurants, but without some of the major crowds, or the dozens of souvenir shops that line the streets of many other tourist destinations. Over the course of the weekend, I tried five different restaurants in Frisco; Boatyard American Grill, Begalis, Prost, Butterhorn Bakery and Cafe, and Lost Cajun. All were within a block of Hotel Frisco, and each one provided a different experience. Boatyard is a great place to get a burger, or bar type food. Begalis provides a nice moderately upscale Italian dining experience. The sausages at Prost were amazing. Butterhorn is a very popular place for breakfast/ brunch. And, I am particularly impressed by the free samples provided to customers at Lost Cajun prior to ordering. And, I enjoyed the casual Louisiana style experience. 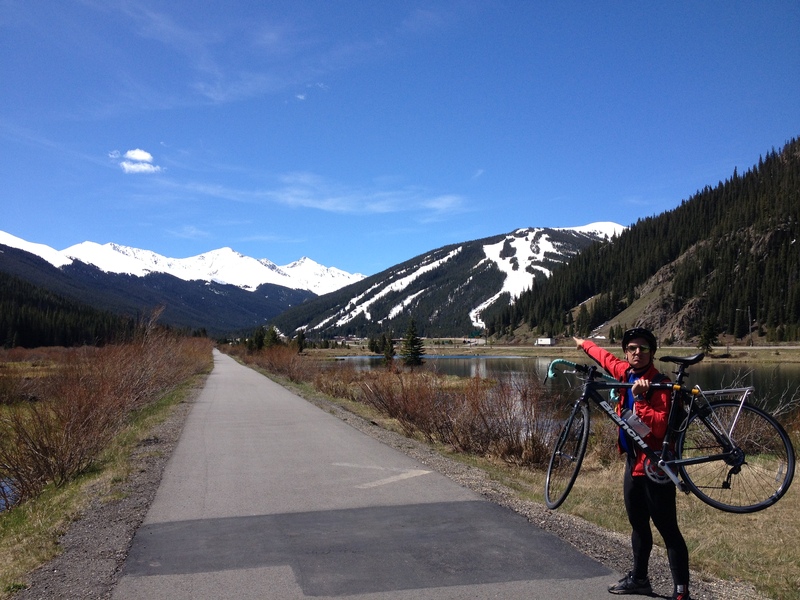 Overall, it is hard for me to imagine a better place for high altitude bicycle training. 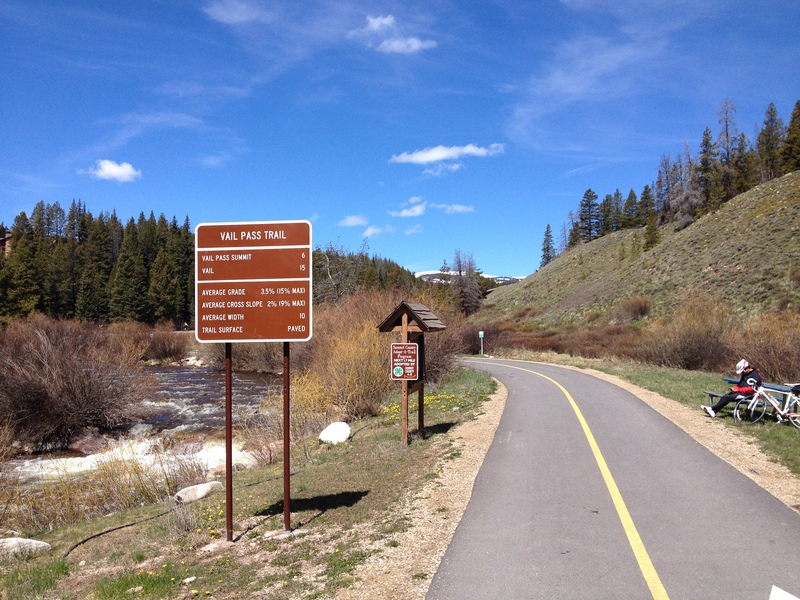 Right in the middle of the Rocky Mountains, there is a place with an extensive network of recreational paths that connect nearly every community in the area. 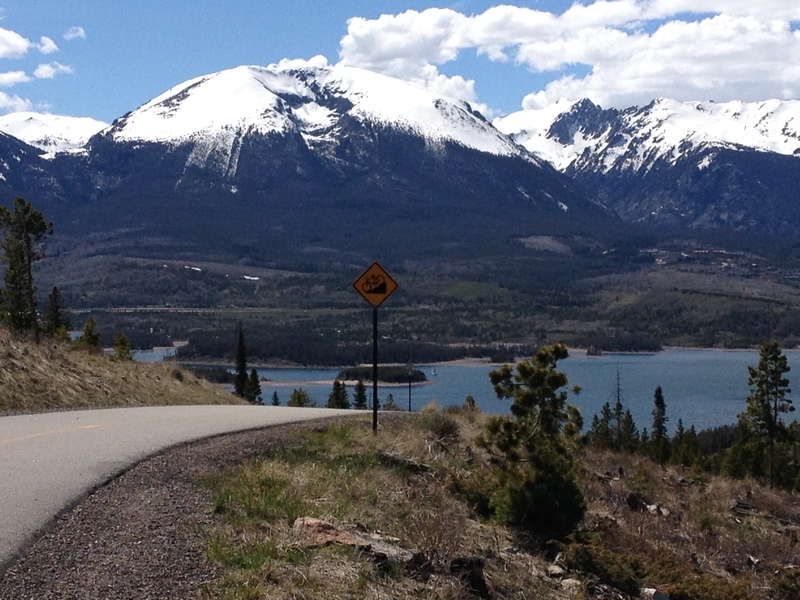 This entry was posted in Colorado, Cycling, tourism and tagged Bicycling, Bike trails, Colorado, Cycling, Frisco, high altitude training, Lake Dillon, scenic rides, Summit County, Vail Pass on May 31, 2015 by Stephen Jaye.